Deliveroo is the best known in the UK, mainly because wherever you go, you’ll inevitably see their delivery men on bikes with boxes full of delicious food. Deliveroo can bring you food from many restaurants, and unlike other delivery services, it offers food from the fanciest restaurants in the city. As it is a new delivery type of service, Deliveroo handles all the transportation themselves. They constantly hire riders that go around the cities by bike or by car, and get the food right to customers’ doors. Deliveroo was founded in 2013, and now it operates not only in UK, but in 12 other countries. In the United Kingdom it operates in over 84 cities and towns. The growth of this delivery service is truly impressive: in 2016 it grew by 650%. 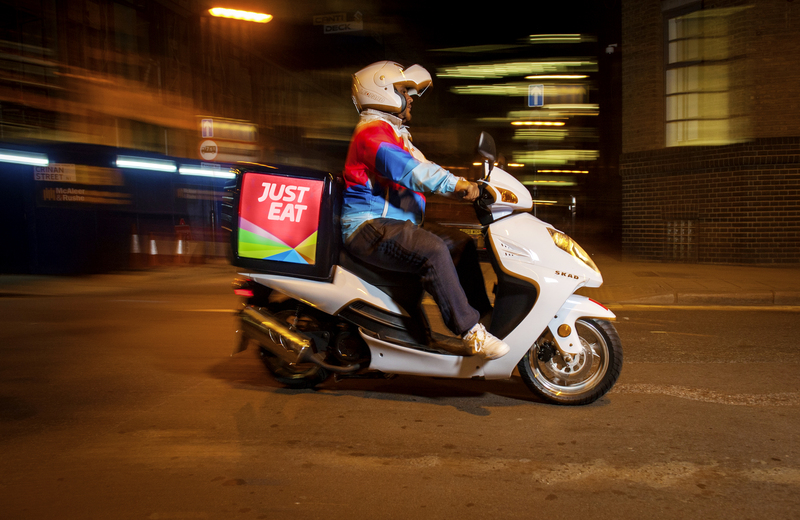 Just Eat is also a global food delivery company that has a goal of creating the largest food community in the world. Just Eat already operates in 13 countries in Europe, Asia, and North America. Unlike Deliveroo, which is considered more fancy, most people prefer Just Eat for some standard takeaways. It has great coverage and the delivery is pretty fast, so if you are really hungry, Just Eat has got your back. Just Eat has many options for pickup and delivery you can choose from. Hungry House is a British food delivery company that was acquired by Just Eats in 2017, and cooperation began in early 2018. Hungry House is relatively small compared to Just Eats or Deliveroo, but still it offers over 10,000 restaurants to choose from and it has a reputation of being a reliable and good service. Foodhub offers delivery from restaurants and takeaways. The greatest thing about them is that they don’t charge any commission, and that means better deals for both customers and restaurants. This allows businesses to thrive, because they don’t have to pay a lot of money like in other food delivery portals. There is also no service charge on orders that other platforms usually have. They have a wide selection of food spots that you can choose from depending on your location. Everybody knows Uber as a driving service, but as food delivery became more and more popular around the world, Uber decided to get into that industry as well. They launched Uber Eats in 2014, and it became the most profitable part of Uber. In just one year from 2016 to 2017 the rides grew 27 fold. Uber Eats offers delivery from many restaurants. You can look through their menus and choose any food you like. After the order is placed, you can track the delivery status in real time, and the food can be delivered by car, bike, scooter or on foot depending on the city.